Below, I’ll show you how I do classes and packages in Corona SDK. I cover how to extend core Corona classes, what you can/can’t do, and how to implement classes, packages, & inheritance in Lua. I also briefly cover some of the OOP alternatives and compare/contrast why I chose t3h closure way. … your main.lua file starts to get unwieldy large in length. Additionally, some things will work differently depending on scope, which to me, makes the code less readable over time. Breaking out your code into classes, separate Lua files, is the first step to managing lots of code. There are 3 steps to make this happen. The code for the most part is treated like other Lua code. If you defined globals, they’ll put on _G just like code in your main.lua. All globals in Lua go on _G. If you’re a Flasher and remember creating classes back in AS1/AS2, this should be immediately familiar to you a la _global. Because of this, you need to treat your code in that file as encapsulated to ONLY put 1 thing on _G: your class. Notice, however, that the package name is completely discarded; all that’s actually stored on _G is your class’ name, so beware of name collisions (such as Player being defined in a completely different package). Those numbers next to table are RAM addresses of where your object is stored. As you can see it’s a unique address, thus you have 3 unique instances of your Player class. Great, we have now have composited both our player.png as well as our HealthBar class both into our Player class. How does it look? Great, full formation with full hit points. Let’s pretend the 1st plane got damaged. Let’s give him 2 public variables to hold his hit points, add them to the constructor, and provide a method to change those values and immediately call it. If the user touches on the plane, and it's hit points aren't at the max value, it'll increment it up by 1. Keep in mind, the same applies to timers (timer), transitions, (onComplete), and collisions (preCollision, collision, postCollision). The use case for a Singleton is when you want to ensure only 1 instance of a class. In Lua's case, we'll just ensure you're always using the same table. Traditionally, Singletons are actually creating instances and not utilizing static variables. Since scope in Lua is really loose via closures, I prefer the static one. Most would call it a static class. Whatever; it ensures only 1 is ever created, and there is no need to have an instance variable over a static one here. The use case here is for the gaming network. Currently in Corona, you can only use 1 game network at a time, whether OpenFeint or Papaya Mobile. We'll create a wrapper class for both scores and achievements since those work on both Android and iOS for both services. We want 1 single class to handle this regardless of which network we've chosen, and regardless of what OS we're running on. 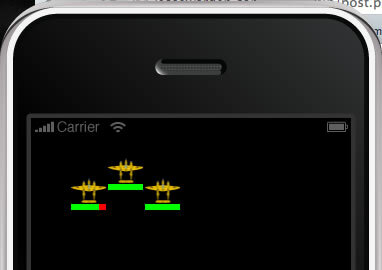 Notice on line 6 it detects which mode we're in, and calls the appropriate gaming network. Also notice that the signature is slightly different with OpenFeint in that you can show some text with the score. Finally, we dispatch a custom event for those who wish to know when the score value changes. That's it, you can continue as you were. One use for statics I've consistently been using is for Sprite Sheets. Since a Sprite Sheet is instantiated once, and instances are created from it, it's a perfect use case for static variables (or class level variables). Here's an example that sets up the Sprite Sheets one time, and only one time. I could put outside of the class's constructor function to let it run when the class is imported and not have to do an if then each time the class is new'd, but I'd prefer errors happen when running code vs. require; a lot easier to debug. All globals are stored on _G. Classes, even in packages, become simple tables on _G. Last in wins, although, if you use the require statement, it'll ensure it's only run once if you require it twice. Although packages are supposed to solve class name collisions, in this case they don't, so just ensure your classes have unique names. Sometimes you're not sure what you're dealing with. You'll print out an object and it'll say "table" with some RAM address. Not helpful. Enter a quick reflection function to see what properties your table has and its values. which gives... well, a really long and interesting output. If you're smart (or drunk), you'll notice no name or package information is retained with your class. Annoying. For the name, some people will utilize a name property, usually as a String. The timer in Corona SDK actually calls itself "timer" for example. This is typically done on an instance basis. I've been using a classType convention with my instances, a sort of homage to createClassObject in ActionScript 2. That way, whenever I want to know what type I'm dealing with I can print it out since Lua's type function only works with Lua primitives. I stumbled upon this Stack Overflow post which corroborated some of what I read on the Corona forums regarding Lua OOP solutions more to my taste. I went down the metatable route, but I was still learning Lua and found it... well, weird. You have to create all these tables and wire them up just to... create a table. Granted, you could abstract it into a base or utility class, but seriously? Additionally, the Corona DisplayObjects and other classes are core C classes with magic on top. As such, you can't affect them with metatables like other Lua tables. Thus the standard fare of wrapping them to extend their functionality doesn't work. Then I found middleclass. After trying to wrap my head around making prototypes in Lua for the mere sake of just getting simple inheritance working (BLAH BLAH BLAH META TABLE REFERS TO ANOTHER TABLE BLAH BLAH META OMG WHAT TABLE ARE WE TALKING ABOUT HERE!!!?!?!?! ), middleclass was a nice breath of fresh air. Over time, though, I had a hell of a time getting it to work extending the native DisplayObjects in Corona. Additionally, I actually didn't end up doing that much inheritance; I'd usually just add existing behavior to built in Corona DisplayObject classes. Now that I actually know what I'm doing 8 months later, I should take a look at it again, it's just what I have above works without the need of metatables. Finally, Mr. Lindquist has a great metatable video tutorial. Use a . when you want to access a variable/property. Use : when you want to call a function/method. Your function, onTimer, isn't scoped to anything; if you print out self inside of itself, it'll be nil. If it's a closure, you can access other objects, but then you start doing things like local self = player. At that point, that's why God invented 9mm's for eating. Same problem; your function is actually scoped to the timer; if you trace out self, it'll refer to theTimer. However, if you make your method a variable instead of scoped to yourself by using a dot like function player.onTimer, and then do the same code above, self will refer to your actual class object like a static. If you're of the functional mind, you can definitely go down the route of advanced closures, and use local's to get your scope back on track. For the rest of us who want to get things done and don't want to go the Delegate.create route, just stick to the above and you'll be fine. You'll notice all methods and variables are public. Additionally, there are no access rules, like getters/setters, since I'm not using any of Lua's special sauce functions like setmetatable or __index. Additionally, while each Lua file only creates 1 global variable, you can access all functions on that object. If you want to emulate private, you can put all your methods as local, put on a metatable object, and use that. So far the Ruby & Python guys seem fine with convention & documentation over access, so... I'm not stressing it. Creating classes in Lua is simply making a table, giving it a new method, and returning that table. Inside the new method you add additional functions to that object you're creating using a colon to ensure it retains self scope inside the function. For callbacks, you just define the event name, such as timer, as a function/method inside your class, and it'll get called with scope intact just fine. For overriding, you just store the super method as a function reference, and call that in your new, same named function. Inheritance is just calling new, and decorating the same object more in your sub-class. While Corona does have packages, all package information is lost so ensure you don't have same named classes if you can help it. All classes become globals defined _G, the main global table in Lua. I stole most of my ideas from Darren who helped me get over some large learning curves. Also, Jonathan Beebe gives an overview of modular classes that are similar to what I do but using metatables. He also wrote another interesting post about using modules, and why he and many others (myself included) do not utilize the module function. The lua.org online manual also has some neat examples of how metatables can be applied. Using the above, you should be able to get all the OOP you need, shield you from Lua's scope rules, and help make your code more manageable as it grows through Composition. Further learning suggestions are the debug object, pcall, and assert. As you start creating more module methods, those last 2 functions will really help you write better, easier to debug and use classes. Good luck and hope this helps! Display objects are regular Lua tables. It’s the metatable where the C code is hiding. I found that you can replace the metatable with your own as long as you keep a copy of the original metatable so that your custom one can pass things to it when needed. With Player:new(), I would recommend using Player.new() instead. It’s a static method, so the reference to self that the : adds isn’t really needed because you already have a reference to Player. Plus, it helps to differentiate static and instance methods by sight for someone who is quickly reading your code. Thanks Josh! I’ll ignore the 1st paragraph until I get a Charlie Gordon shot. To your 2nd paragraph, I agree too, it’s more consistent with the API they provide. I’ll give a whirl! Great and very helpful tutorial. Thanks. Can you post a link to the sourcefiles for this tutorial or are they on github? Thanks for the great write ups! Definitely making the transition into Corona a whole lot less painful. I checked out your code for the top down Tyrian esque game as well. I am working on a few general libraries that should hopefully make Corona development even less painful – a TouchManager for figure out how the playing is tapping, swiping, etc (multi touch as well) and also some ParticleEffect engine stuff. While I wish Flash was viable (and still might be…) on mobile I am glad people like you are moving into the Corona community. Thanks for the great article. I’ve tried the meta table thing but I found it to be much work for… creating a table … like you said. Giving your method a try … I’m a AS3 developer and I’m used to working with object oriented languages and this “Lua thing” is very confusing to me. Thanks again for explaining everything… it saved me a lot of time. i have a file lua for the class and the main.lua… can you distinct where i need to put every portion of code? @andrea main.lua always goes in your root folder. For classes, you have 2 options: to use packages or not. Packages are synonymous with folders. If you don’t provide/use a package, then the class goes in root (next to main.lua).